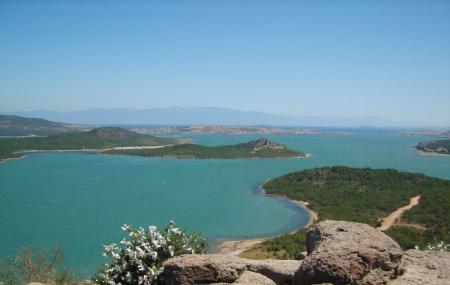 Near the suburb of Camlik, on top of a small hill, is the best viewpoint in Ayvalik. There, you’ll find a rock with a curious footprint called the Devil’s Feast. Apparently the Devil left it in the rock when he jumped over to Lesbos. From the top, you have wonderful panoramic sites of the pine forests, seas, islands and the city. There is no better place in Ayvalik to spend your sunset. To get there, take a minibus from Cumhuriyet square in Ayvalik. Minibus from Cumhuriyet square in Ayvalik. How popular is Devil's Table? People normally club together Ida Dalis Merkezi and Sarimsakli Plaj while planning their visit to Devil's Table.